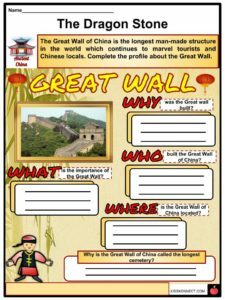 Ancient China was one of the oldest and richest cultures in human civilization. 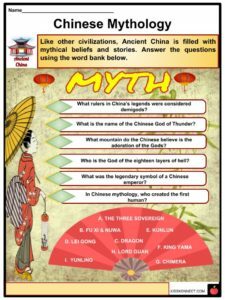 Ancient China was one of the oldest and richest cultures in human civilization. The term ‘China’ is derived from the Sanskrit word Cinna from the Chinese Qin Dynasty. It was not until 1516 CE when China was seen in print through the journals of Barbosa and was further popularised by Marco Polo. 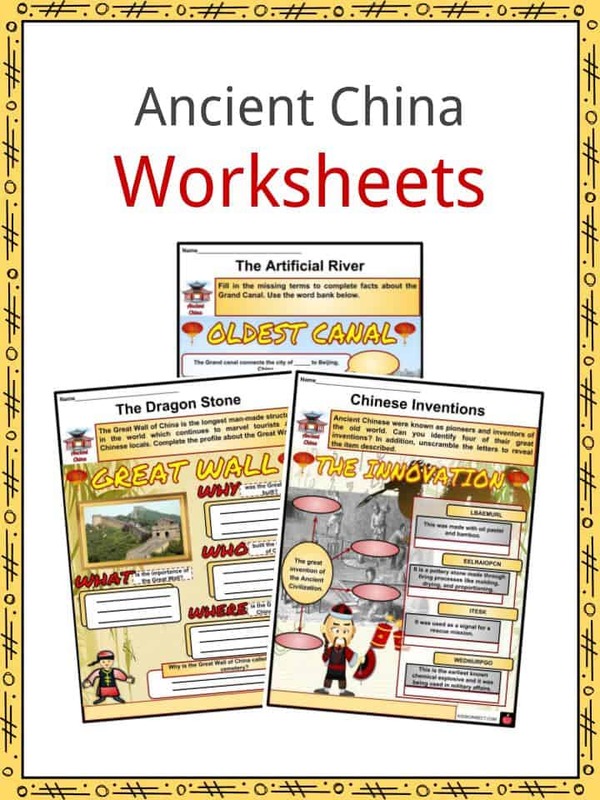 See the fact file below for more information on Ancient China or alternatively, you can download our 25-page Ancient China worksheet pack to utilise within the classroom or home environment. The earliest skull fossil discovered in China was a Peking Man in 1927 CE near the capital, Beijing. According to evidence, the early inhabitants already utilised stone tools and fire. Around 5000 BCE, Yellow River Valley became the cradle of civilization in the East. It is believed that farming communities began to emerge in the Henan province. Farming communities began to expand and consolidate centralized government which then became the first dynasty of China. Between 2070 and 1600 BCE, the Xia Dynasty existed with Yu the Great as its founder. It is believed that he worked for long years to control the flooding of the Yellow River. Yu was also believed to have established the system of dynasty and succession. During the first dynasty, the ruling class populated urban areas, while peasants were more agricultural. The second dynasty, Shang (1600- 1046 BCE) was established by Tang who overthrew Yu’s descendants. The system of writing, religion, architecture, and bronze metallurgy were credited in this dynasty. Around 1046 BCE, Zhou Dynasty was set up by King Wu of the Zhou province after he rebelled against King Zhou of Shang. Chinese philosophers such as Confucius, Mencius, and Lao Tzu flourished during this era. 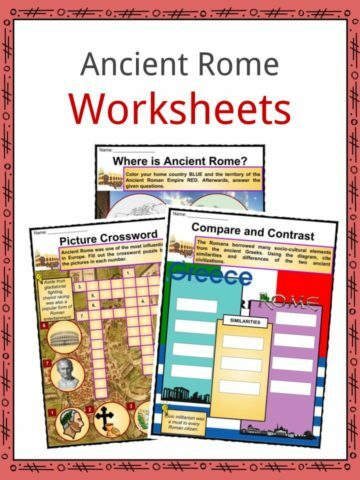 Moreover, codification and iron metallurgy also became sophisticated. The Imperial Era in China emerged during the Qin Dynasty (221-206 BCE). Shi Huangdi, its founder, ordered the destruction of walled fortifications and building of the Great Wall of China. ”It stretched for over 5,000 kilometres (3,000 miles) across hill and plain, from the boundaries of Korea in the east to the troublesome Ordos Desert in the west. It was an enormous logistical undertaking, though for much of its course it incorporated lengths of earlier walls built by the separate Chinese kingdoms to defend their northern frontiers in the fourth and third centuries.” (Scarre and Fagan, 382). The Han Dynasty was founded by Liu Bang, Emperor Gao who began to employ intellect rather than aristocracy in running the bureaucracy. It was then followed by the Six Dynasty, Sui, Tang, and the Song Dynasty which led to modern day China. The major key of Chinese civilization and culture is based in geography. Ancient China flourished due to two major rivers that flowed through the central region. The Yellow River located to the north is 3,395 miles long making it the sixth longest river in the world. Aside from being the cradle of civilization, the yellow river is also called the Huang He River. The Yangtze River located to the south is 3,988 miles long and is the third longest in the world. Due to its warm and rainy weather, the banks of the Yangtze are good for planting rice. Since 105 AC, Chinese people began paper making which easily spread through central Asia along the silk road. During the Song Dynasty, Bi Sheng invented movable type printing made of hard clay and iron plates. This type of printing spread quickly through Europe and became one of the leading features of the Renaissance era. About 1000 AD, a Chinese taoist alchemist invented gunpowder originally used for firecrackers. Between 2nd century and 1st century AD, the compass was invented in China and used in Feng Shui. By 1000 AD, navigators began to use it for directions. The water driven mechanical clock was invented by Yi Xing, a Buddhist monk in 725 AD. A hundred years later, a more advanced Cosmic Empire clock was invented, which was 200 years earlier than the European mechanical clock. During the Tang Dynasty, tea became a popular drink among ancient Chinese people. About 6,000 years ago, silk weaving was already mastered by the Chinese. 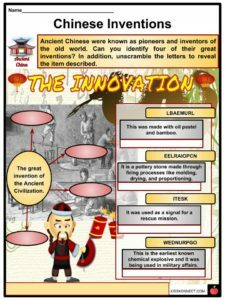 Among other inventions of Ancient China include the umbrella, acupuncture, iron smelting, porcelain, kite, seed drill, and paper money. 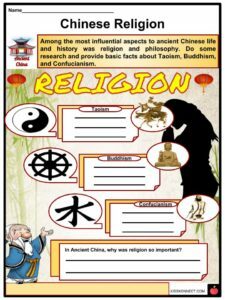 Ancient Chinese ideology and history was shaped by three major philosophies and religions, Taoism, Confucianism, and Buddhism. Founded during the Zhou dynasty, Taoism was proposed by Lao-Tzu. Taoism believes in nature’s balance of forces called Yin and Yang. They believe that all opposing forces such as dark and light, and male and female are always balance. Following Lao Tzu was another thinker, Confucius, who believed that honoring the family is a vital virtue of every society. 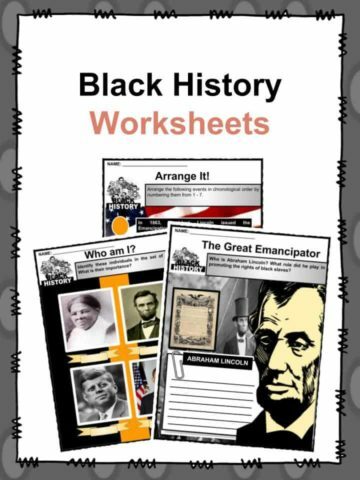 Moreover, he also taught that government should be strong and organized. In 563 BC, Buddhism spread throughout India and China. This belief is based on the teachings of Buddha and the idea of enlightenment. Like the Hindus, Buddhists believe in the idea of rebirth and life as a cycle. Moreover, they share the faith of karma. Aside form ruling under dynasties, ancient China heavily relied on the feudal system. 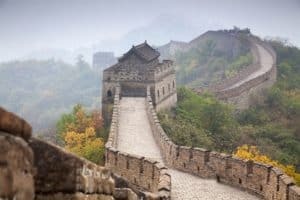 The Great Wall of China was built to try and keep the Mongols away. Until today, the new year celebration is the biggest festival among Chinese people. The practice of taking civil service exams before being a government official is also from China. 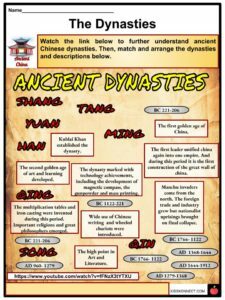 This is a fantastic bundle which includes everything you need to know about Ancient China across 25 in-depth pages. 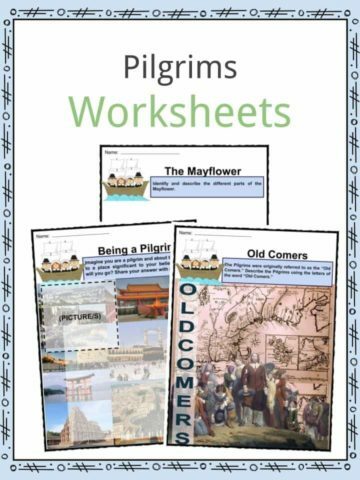 These are ready-to-use Ancient China worksheets that are perfect for teaching students about Ancient China which was one of the oldest and richest cultures in human civilization. The term ‘China’ is derived from the Sanskrit word Cinna from the Chinese Qin Dynasty. It was not until 1516 CE when China was seen in print through the journals of Barbosa and was further popularised by Marco Polo.